A home’s roof is its primary shield against the elements. It’s also the single largest structural component of your house. That’s why maintenance is both very important and also extremely tough to undertake. While it might be tempting to go at it yourself, there’s nothing better than going for professional, truly quality cleaning and maintenance like what we offer at Tedrick’s Roofing. It’s your best bet for a roof that lasts a long time. A hand broom is used to delicately sweep off loose gravel and other smaller debris from the roof’s surface. If you have a particularly large roof, we use a power broom instead. The garden hose you use to keep your plants and trees healthy can also remove dirt and debris that builds up on your roof. 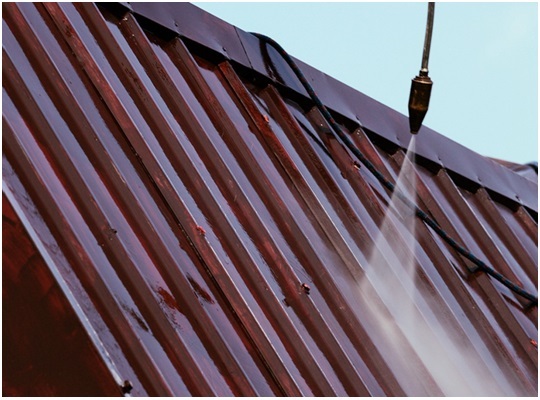 If it’s a really serious buildup, a high pressure washer will come in handy on certain types of roofing. A shovel that’s normally used for moving dirt around can also be used to efficiently and quickly remove accumulated leaves, twigs, and other debris from your roof. When painting or coating is needed, we rely on a hand roller of varying sizes to get to every nook and cranny of your roof. It takes an expert eye to spot what needs to be done, and an expert hand to be able to use the right tools on the roof carefully yet skillfully to get the job done right. This last bit is important because improper handling of these tools could damage your roof more than it can clean it. There’s also the matter of safety—going up there yourself risks a fall and physical injury. That’s why, for a thorough, professional roof cleaning, you should call on the roofing contractor Auburn residents trust their homes to: Tedrick’s Roofing. We have the latest in equipment, and the skills and experience to see a job thoroughly completed from start to finish. Give us a call today for a free roof inspection. You may also check out our full infographic on the right cleaning and maintenance tools for your residential roof.